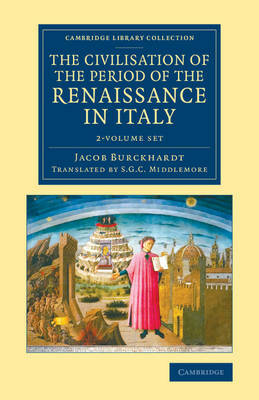 On several journeys to Italy in the mid-nineteenth century, the Swiss historian Jacob Burckhardt (1818-97) saw in the figures and events of the Italian Renaissance certain traits that he believed to be mirrored in the politics of his own day, notably some aspects of 'an unbridled egoism, outraging every right, and killing every germ of a healthier culture'. Revolutionary in his all-encompassing and unflinching examination of the Italian Renaissance, Burckhardt saw developments in statecraft and war as giving rise to the more publicised artistic progress of the era. First published in 1860, this work is considered to be his magnum opus on the subject, and is here reissued in the accessible two-volume English translation of 1878 by S. G. C. Middlemore. Volume 1 considers the state as a work of art, the development of the individual, and the revival of antiquity in education and philosophy. Volume 2 considers scientific discoveries, changes in society and festivals, and developments in morality and religion.